TYDINGS HOME REMODELING is a premium BATHROOM REMODELER serving the Charlotte, Concord, Harrisburg and Salisbury North Carolina area. Fence disigns that will set your yard apart! Outdoor kitchens that will make your neighbors jealous! Hardwood and Laminate flooring installer. Hardwood, Laminate and Tile Floor Installation. Quality Flooring Installation and Removal. There is a large variety of Flooring in today’s market. Hardwood Flooring comes in many styles. There are so many varieties that to bring all the different samples to your home would take a large truck. It would be best to go to a supplier such as Lumber Liquidators to find what you want. Then give us a call, we can pick it up and install your hardwood flooring for you. Laminate flooring also comes in a large variety to choose from. From inexpensive to very costly. The higher cost Laminate Flooring looks exactly like Hardwood Flooring when installed. Tile Flooring comes in many sizes and patterns. 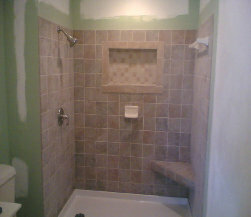 Tydings Home Improvements can install any size or pattern of tile flooring.